She was dubbed the ‘world’s hottest grandma’ after entering an online modelling competition earlier this year. And now Gina Stewart is officially a social media sensation, with 95,000 loyal Instagram followers – and counting. ‘I just wanted to take this opportunity to thank you all so much for following me,’ she said. ‘It’s been ten months since I joined Instagram and I’m nearly up to 100,000 followers,’ the Gold Coast granny said with a beaming smile. 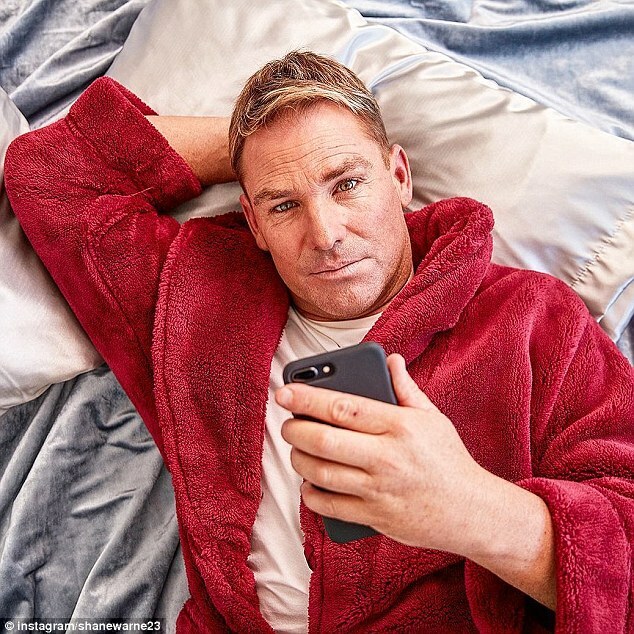 Among Gina’s thousands of followers is none other than Shane Warne. The cricket legend was recently busted ‘liking’ a raunchy image of the lingerie-clad mother-of-four posing seductively in her bedazzled bedroom. Gina’s public profile has skyrocketed over the last few months, with her newfound fame landing her lucrative endorsement deals with DealerStrip and SexySelfies. She’s also become an in demand media figure, appearing everywhere from Channel Seven’s Sunday Night to Poland’s TVN. The bombshell has also been in talks with Married At First Sight for a potential spot on the show’s upcoming sixth season. Despite having double-E cup breast implants, the rest of Gina’s beauty is all natural. The Brigitte Bardot lookalike has previously stated that she believes in ‘ageing gracefully’ and has never had Botox or fillers.